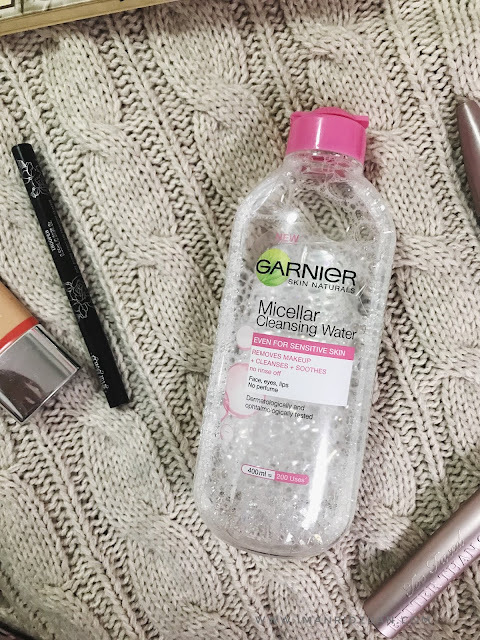 I thought I would never be a fan of micellar water. 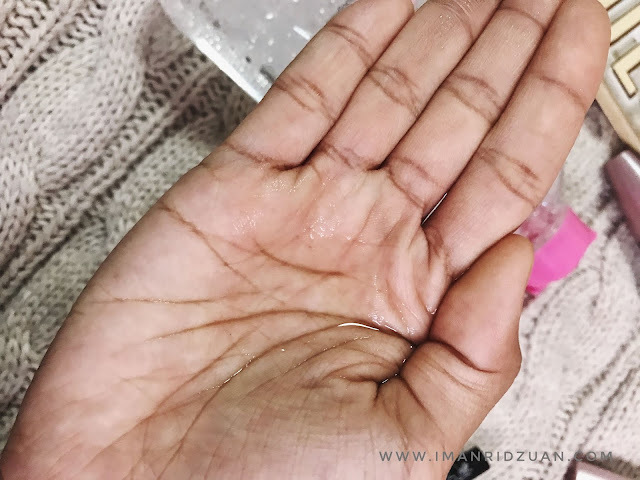 I knew they work great, because I got a sample of Bioderma's micellar water back then, but I didn't think that it would be a life changer for me. I'm more towards oil cleansers when it comes to removing my makeup. I thought it would be troublesome because you would also need to use cotton pads with micellar water. Until my friend introduced this babe to me haha. Bioderma used to be the thang, but they're so expensive for everyone to be able to enjoy. 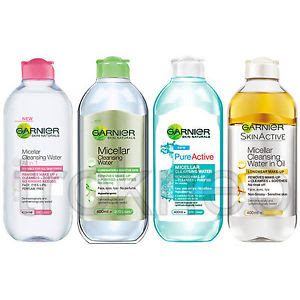 So when Garnier came up with their own, they pretty much own the customers when someone mentions the word "Micellar Water". Almost everyone I know owns it. At least in my country here in Malaysia. I didn't bother to try it at first. But my friend who have an amazing skin told me that she uses this everytime before she cleanse her skin, even if she's not wearing makeup, I thought I would give it a try. And I never regret! First of all, just in case if yall don't know what a micellar water is supposed to do for the skin and how is it different than just a normal water? It's not a type of element that exists in water, it is actually a mix of purified water, mild surfectants and hydrating elements. 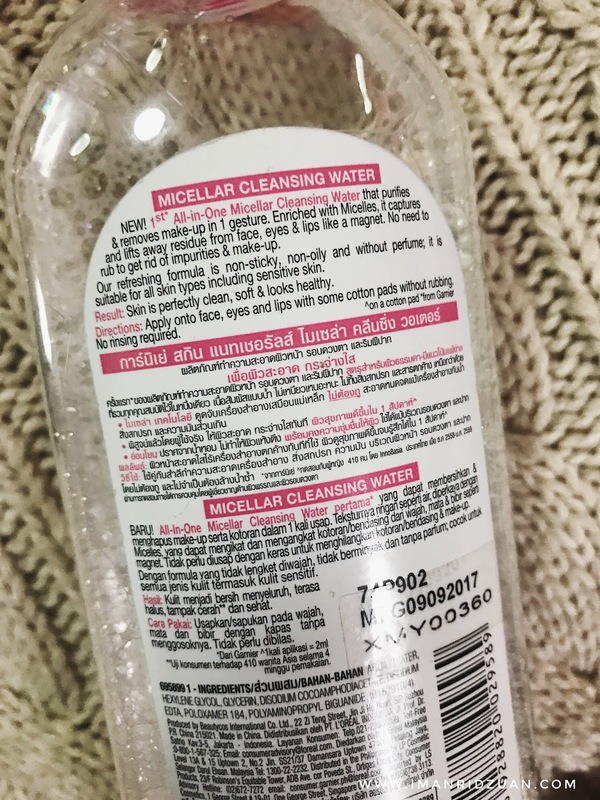 The word micellar itself means that the water is made of oil micelles (tiny cells) suspended in soft water that are supposed to act like magnet and attracts all of the dirts, oil, dusts, grimes and other nasty things on your skin without drying your skin, which where the hydrating ingredients play part. For instance, Glycerin. Now, let's get to the review of this bebe. Actually there's nothing much to talk about it, because it is very self explanatory. It is water, that cleanse your skin. LOL. But okay, I'll try to get to the bottom of this thing, judging it in terms of the performance of the brand, because I've used the Bioderma one, which is the mother of all micellar water, so I can compare. It is so cheap. Like, really cheap if you ask me. It is only around RM28 ($6) for this huge bottle of 400ml. I mean, for the technology? HECK YEAH! And we all know how Watsons and Guardian are huge competitors, so they always have this on sale since it is one of their best selling products. You can buy the smaller bottle for like RM13 if you wanna test it out first. They came out with a bunch of versions which you can choose for your skin type. I just picked the original one, which is in this pink cap, that is also suitable for sensitive skin. I've never tried the other versions, but my sister owns the yellow cap one, which is oil-infused and she loves it just as much. But I have no problem about this one that I am using. It cleanses very well! It takes away my foundation, sunscreen, eyeshadow, my eyeliner, everything, except my waterproof mascara. I mean, it makes sense right? Only oil can take off waterproof mascara. But when I think back of when I was using Bioderma, that thing actually takes off my waterproof mascara, and it takes em off really well and fast. A lil confusing, but I mean. For Garnier's price? I really don't care much. I'll just use a separate eye makeup remover afterwards. As you can see from the third picture above, I did take most of the mascara off after vigorous rubbing. You do not want to do that onto your eyes though or else you'll create premature wrinkles. I could settle with using my Biore oil cleanser to remove my makeup, but the thing is, I think that this micellar water helps to improve my skin. Ever since I've used it, it's pretty rare to get an acne. I pretty much used my frriend's advice, which is to use this before I wash my face. So even when I am not wearing makeup, I just use this to wipe away any dirt and oil and it makes my skin feel so fresh and clean. The best part is that you don't have to rinse it off if you don't want to, but I still do anyway since I am gonna wash my face with cleanser afterwards. But on lazy days where I don't feel liek doing my full skincare routine, I just wipe wipe wipe away my face with this, and clock off.